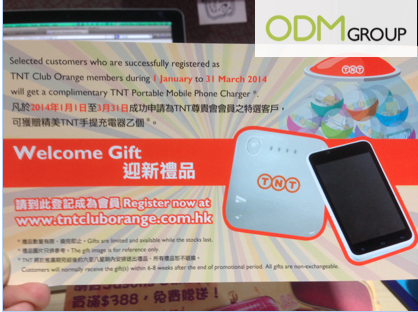 TNT is giving out complimentary TNT portable mobile phone charger to selected customers who are successful registered as TNT Club Orange members during 1 January to 31 March 2014. Portable mobile phone chargers are now very common with people these days due to their extensive usage of the smart phone. As such, making portable mobile phone chargers a perfect marketing gift for your clients. Read on more to find how why! People these days own at least one smart phone, and they rely on it heavily. From reading books to purchasing groceries online, a smart phone can do almost everything. With that being said, its battery life also gets used up quickly. Thus, the solution would be to have portable mobile phone chargers with you all the time to prevent your mobile gadgets from having empty battery! Not only so, they are a very great travel promo gift since travelling would use even more battery as one has to research on the web often and take pictures to send to the loved ones back at home. It also aids in travelling light, especially for people who enjoys convenience. They do not have to constantly worry about charging points and different power plugs. Many companies have been using portable mobile phone chargers as their promo gift. These includes TNT, Dah Sing Banking Group Limited and 7-Eleven HK, proving it to be a successful promotional giveaway. Not only so, it is easily customizable with your brand name. Your customers, feeling thankful for the power up when their phones are emptied, will notice your brand logo easily and remember your brand name easily! So, wait no more, contact ODM Asia today for your portable Mobile Phone Charger Giveaway!